As home networks become common, the same issues that plague businesses arise - the ever increasing need for storage, and managing backups and the backup window. I have been on the lookout for simple Network Attached Storage (NAS) devices to use as bit buckets for storing everything from MP3's to system images. In the corporate setting, there are a number of low-end, Windows Server-based NAS appliances that work just fine. I have put Dell PowerVault NAS appliances into a number of different office and development environments with great success. For home use however, the price point, power consumption, noise, and heat become issues. There are a number of products from Linksys, Snap, Iomega, and Buffalo, but they all tend to either be too expensive or too complicated. I don' t want a whole new server with email, DHCP, and LINUX apps running just to get network storage. 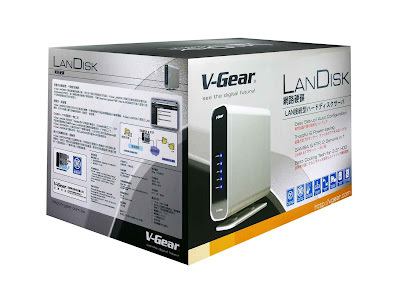 And so to the V-Gear LanDisk. Sold by a company in Taiwan I had never heard of, this little box does exactly what the name implies. It is a stylish little enclosure in which you install the 3.5" hard disk of your choice. Connection and setup are incredibly simple. After inserting your hard disk into the space provided, it is just necessary to attach the included power and IDE cables. Two screws secure the cover, and then it is just a matter of inserting an RJ-45 cable to connect to your switch, and the included power which comes from a wall wart. Administration is just as simple. Using a browser, you type http://landisk and the admin page comes up. There is a very sparse set of choices which basically come down to formatting the disk (FAT32), creating the share permissions, and setting the identity of the device for Windows networking. Immediately, all other computers on your network can see and map to the share. The unit can also act as an FTP server, and there is an administration menu to set that up. The web site makes reference to firmware updates, so it looks like any bugs will be taken care of that way. To try the unit out, I inserted an old 20Gb Maxtor that I had lying around. It had been formatted as NTFS under WinXP in its previous life, and the LanDisk was not happy when it tried to display disk statistics. I clicked the format button, and a few seconds later, the drive showed up as an empty 20Gb drive. I moved files on and off to make sure that everything worked as advertised, and created folders and shares. Confident that it all worked as advertised, I decided to splurge on something significantly bigger, and bought a Seagate 200Gb drive. Again, after clicking format, it was less than a minute before I had a usable system. Wonderful, simple, and reasonably priced (S$175 from South Asia at Funan), I am very happy with this unit. this tiny thing is awful. If I make a playlist for winamp, the first song plays, and the rest dont, because they seem to be zero size. Files with german Umlaute (special characters) can't be created. If I want to do the same with linux, I cant even access the files in the underlying directories, because linux cant state them as directories. I tried lufs with ftpfs as workaround, with no succes either. I have got a firmware v"landisk 010", now it works almost perfectly with linux, but my windows problems are the same. Nevertheless I can use landisk now what I have bought it for. The market situation shows that I have got the cheapest NAS for one hdd currently available. Where did you get the firmware upgrade? The web site is not showing any files to download. But "under hand" it was send by e-mail. Thanks, I successfully downloaded the version 10 firmware and installed it. I wonder why they aren't posting the firmware on the website?